Cervical headache is a condition where the headaches are caused directly by a sub-occipital and neck problem. During the past few decades, all types of headaches were thought to be related to inside head disorders. New scientific research now associates this condition with an injury or neck trauma. A Norwegian study (Acta Neurol Scand 2007; Nov 20; SJAASTAD O, Bakketeig LA) demonstrated that 4% of the population is subject to this type of headache. Prescriptions drugs will improve the symptoms; however, they will not address the cause. Headaches associated with shoulder, shoulder blade and arm pain. It is also important to get proper diagnosis and eliminate the presence of hypertension, as it can also cause headaches. Another Norwegian study observed cervical headaches following a whiplash injury in the neck. This study, conducted on 587 victims, was completed over a 6 year period. Eighty-eight percent of whiplash victims developed cervical headaches within six weeks from the accident and 35% of them were still suffering from headaches 6 years later. In our clinic, we make sure to run a full examination of the neck area on all headache examinations. It is important to determine the presence of factors such as previous accidents, abnormal posture and other factors that may possibly be causing abnormal pressure on the nerves of the neck and headaches. Chiropractic is a safe, non-invasive, and efficient approach for the improvement of cervical headaches. 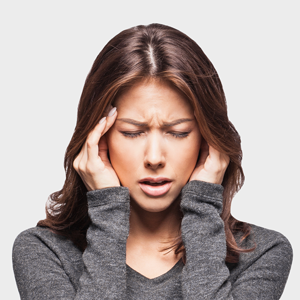 Call (514) 694-0303 and arrange an appointment to find out if the cause of your headaches might be neck related.